Lakefront apt. property. The Red Barn is a fully restored historical home on Hayden Lake, ID. At one time it was the 'carriage house' for the Clark Mansion located on Hayden Lake.The property has 2 acres with grass lawns and towering pine and cedar trees. 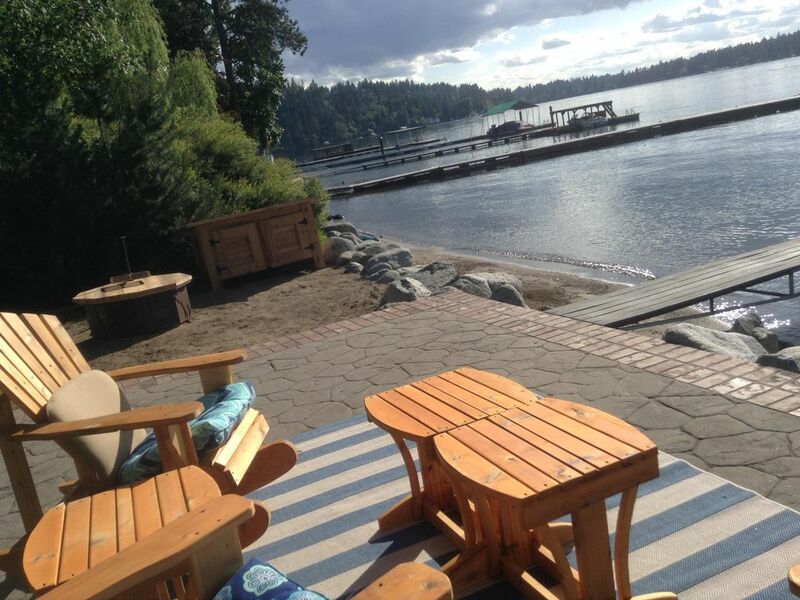 It is one of the few lots on Hayden Lake that has a gently sloping manicured lawn that leads directly to a sandy swimming beach, a 2 slip boat dock and a beach patio with outdoor furniture and fire pit. Paddle boards are available for your use. This rental unit has wonderful views of Hayden Lake. Hello! My name is Cindy Pearson. My husband David and I purchased this beautiful historical home in August of 2013. We fell in love with 'the Red Barn' as it has the old time Idaho lodge feel and it is located right on the shore of beautiful Hayden Lake. After living in Texas for 30 plus years we decided to live in Idaho because of it's beauty, lakes, skiing,bike trails and cooler weather. And we invite you to come visit and see for yourself all the natural beauty and comfort of an Idaho Lake vacation. Very nice place right on the lake. Clean and easy to get to. The apartment is above the garage and very private. Also kitchen is well stocked with everything you need to cook your own meals. The host is very responsive and informative. I would highly recommend staying here. Great spot very cozy and clean. The dock for the boat was perfect. We’ll be back fir sure!! Wow! Everything was as indicated in the description. Cindy was extremely easy to work with and checked-in with us several times to ensure that we had everything we needed. Big bonus was the use of the paddle boards and kayak. We did bring a couple of water floats that we used a lot. Would recommend without reservations! Awesome accomadations! Cozy comfy bed with quality linens. Great sandy beach and dock. Enjoyed the kayak provided by hosts. Top notch Hayden Lake experience! Everything was perfect! The place was extremely clean and plenty of room for our family of 4. We were able to park under a carport, which was a nice bonus. Of course, we spent most of our time at the lake, which was simply amazing. There are paddle boards and a kayak to use, and we definitely did! Cindy was a pleasure to work with. She went above and beyond to ensure that our stay was a great one. We are already planning our trip next year! Very spacious apartment with all the amenities. Beach is beautiful. Definitely would stay again! Thank you for staying at the Red Barn. We are glad you enjoyed your stay. We are thankful for wonderful guests like you! Conveniently located a few minutes from Walmart, Silver Lake Mall, and Triple Play Family Park and Grocery Stores. Silverwood Theme Park / Water Park is only 20 miles away. Lakefront property situated on beautiful Hayden Lake. Property has private sandy beach and beachside patio and fire-pit. Lush green lawn.